Home / Football / Happy Taysom Hill/Fred Warner Day: 4 Days to Kickoff! 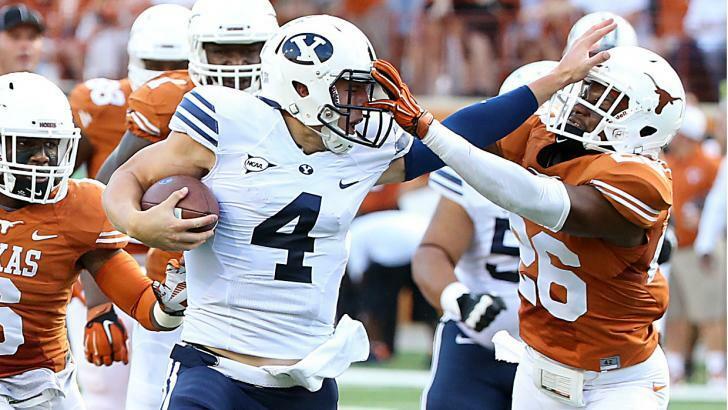 Happy Taysom Hill/Fred Warner Day: 4 Days to Kickoff! The 2015 Countdown to Kickoff continues with 4 days until BYU’s season opener. Each day we highlight the player or two that wear that day’s number on their jerseys. If you check back with us each day, by the end of the summer you’ll know every player on BYU’s roster in 2015. Happy Taysom Hill/Fred Warner Day! 2014 Stats: Started all 5 games before season-ending ankle injury; Rushed for 460 yards and 8 TDs on 87 attempts; Passed for 975 yards on 88/132 with 7 TDs and 3 INTs. 2014 Stats: Recorded 24 tackles, 1 tackle for loss, 1 pass breakup, and returned an interception 20 yards for a TD in 10 games played (4 starts). ← Previous Story Happy Nick Kurtz/Dayan Lake Day: 5 Days to Kickoff! Next Story → Happy Colby Pearson/Sam Baldwin Day: 3 Days to Kickoff!